One Dog At A Time. In 2006, during a tour of duty in the Afghanistan town of Now Zad, Royal Marine Sergeant Pen Farthing helped break up a dogfight. Located in Helmand Province, this was an area once described as the most dangerous place on Earth. Pen could not resist the soulful eyes of one of the street dogs he saved, whose ears had been cut off for fighting. He ended up befriending the dog and named him Nowzad. After his tour of duty ended, Pen went through a difficult process to bring Nowzad home to the UK. He quickly realized that he wasn’t the only one hoping to do the same. Pen founded NOWZAD, and soon began the process of reuniting dogs with the soldiers who had befriended them in war zones around the world, including Afghanistan, Iraq, Ukraine, Kuwait and Libya. Through donations, happy homecoming destinations have included USA, UK, Australia, Belgium, Canada, Germany, Holland, Italy, Spain, Jordan and South Africa. Seven of the rescued street dogs have become fully fledged service dogs in the United States. The dogs are a much valued and loved lifeline to their veterans who have been diagnosed with PTSD. That these dogs endured a war zone like their handlers only strengthens the connection and understanding. Nate, reunited with Hannah through the efforts of NOWZAD. Hannah is now Nate’s service dog. Lexi, moments after being rescued. Sadly, Staff Sergeant David P. Day, 26 of Gaylord, MI, later gave his life in service with Fox Company, 2nd Marine Special Operations Battalion, during combat operations in Badges Province, Afghanistan, April 24, 2011. Hope For Animals In A War-Tone Region. The charitable organization has reunited more than 900 dogs and cats with the soldiers. NOWZAD also runs the only animal shelter and clinic of its kind in all of Afghanistan. Currently, it is home to around 150 dogs, 40 cats and six donkeys. The modern veterinary clinic is staffed by a team of Afghan nationals. In addition to animal welfare education, NOWZAD’s mission at the clinic is the prevention of the spread of rabies. They are also implementing a humane trap, neuter, vaccinate and return program in Kabul for cats. Who Rescued Whom? Often, the brave men and women serving their countries in war zones around the world, find themselves adopting a stray dog or cat struggling to survive. The animals end up providing a respite from war; a moment of peace, home and love. Leaving them behind, after their tour of duty is over, is unthinkable for many of these soldiers. NOWZAD arranges for the dog or cat to safely get to the Nowzad clinic where shelter and care are provided. They spay/neuter all rescues and provide any other required medical attention as well as vaccinations. Then, they carry out all necessary checks and paperwork to ensure the animal will arrive to its final destination, back in the arms of its loving warrior. November, 2011/JFK Airport. With the help of American Dog Rescue, NOWZAD was able to make this emotional reunion possible between Adam and his battle buddy Freedom. The New Barker dog magazine was first introduced to Pen Farthing and NOWZAD in 2011 by Florida’s own Arthur Benjamin of American Dog Rescue. Pen has written the bestseller “One Dog at a Time, Saving the Strays of Helmand.” The NOWZAD charity has support from animal lovers all over the world, including Ricky Gervais, who donated the profits from one of his warm-up gigs, earlier this year. The warm-ups took place ahead of Gervais’ national tour of his stand-up show, appropriately called Humanity. Author Anna CookePosted on July 4, 2017 January 28, 2019 Categories "The New Barker dog magazine", #DogFighting, Dogs, rescue, shelter work, volunteers, veterinarians, vet techs, compassion fatigue, caregivers, The New Barker dog magazine, UncategorizedTags American Dog Rescue, Cathy Kangas, Dog Rescue, Dogs, Freedom, HSUS, Humane Society of The United States, lifestyle, Marines, Military, NOWZAD, Pen Farthing, Prai Beauty, Ricky Gervais, shelter, The New Barker dog magazine.1 Comment on One Dog At A Time. Her Name is Lucca, the Military Working Dog. Retired U.S. Marine Rober Harr, 86 (center) with U.S. Marine Gunnery Sgt. Christopher Willingham (right) and U.S. Marine Cpl. Juan Rodriguez (left) with Lucca on the Natural Balance 2013 Rose Parade Float, Canines with Courage. (Gary Friedman, Los Angeles Times). A decade ago, Military Working Dogs like Lucca would have most likely been euthanized after her service. The dogs were considered government equipment and too dangerous to return to domestic life. 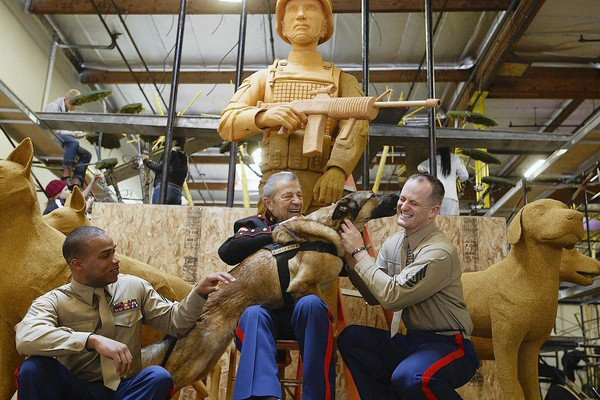 Thousands of dogs working for the military have been sent overseas since 1942. Over the years, many have been left behind as excess equipment. During the Vietnam War, about 4,000 American war dogs were employed in various capacities. About 300 dogs were killed in action or were victims of either tropical diseases or infections. The rest of the dogs were reportedly put down by military veterinarians or given to the South Vietnamese Army. In 2000, President Clinton signed a law allowing retired soldiers and civilians to adopt the Military Working Dogs after their deployments. John Burnam, who served in Vietnam and wrote a first-person account of working with a front-line scout dog named Clipper, will also be riding on the float today. Clipper never made it back to the United States. Burnam is president of the foundation that established the Military Working Dog Teams National Monument, which is scheduled to be completed in October, 2013. Burnam’s story about Clipper inspired Rep. Walter B. Jones (R-NC), who introduced legislation for a national monument. In 2008, President Bush signed the bill into law, and President Obama authorized Burnam’s foundation to build and maintain the San Antonio, Texas monument. The bronze statue features a Doberman Pinscher, German Shepherd, Labrador Retriever and a Belgian Malinois leading a dog handler on patrol. The $1.2 million dollar price tag was funded solely by grants and donations led by sponsors Natural Balance, Petco and Maddie’s Fund. Cpl. Juan Rodriguez, 23, credits Lucca with saving his life. The dog sniffed out a booby trap, setting off the bomb that took her leg. Cpl. Rodriguez later escorted Lucca to her first handler, Marine Gunnery Sgt. Christopher Willingham, 33. Lucca is living the life of spoiled retirement, and enjoying every minute of it. The New Barker dog magazine is honored to be a longtime supporter and sponsor of Military Working Dog Team Support Association (MWDTSA). Over the years, through the support of our retail advertisers and their own generous customers, supplies have been collected for the dogs and their handlers currently deployed overseas. We have collected the donations and transported them to the SPCA Florida in Lakeland. There, they are either shipped to Atlanta, or Dixie Whitman, the executive director of MWDTSA drives to Lakeland from Atlanta to pick up the supplies. Dixie then packages and ships the supplies directly to the deployed handlers and their dogs. You can learn more about this fine organization by reading Lucca’s story. Supplies continue to be collected at Fluffy Puppies, Clearwater; Gone to the Dogs, St. Pete Beach; Groovy Cats & Dogs, Tampa; One Lucky Dog, St. Petersburg; Paw Paws Pet Boutique, Madeira Beach; Pawsitively Posh Pooch, St. Petersburg; Pet Food Warehouse, St. Petersburg; Pet Supplies Plus, Clearwater & Pinellas Park; and Wet Noses Boutique, Sarasota. Author Anna CookePosted on January 1, 2013 January 1, 2013 Categories UncategorizedTags Dixie Whitman, Dog, Dog Magazine, Dogs, Florida, Florida dog, Florida Dog Magazine, Florida's top dog lifestyle magazine., fun with dogs., LA Times, life with dogs, lifestyle, Lucca, Military, Rose Bowl, Rose Parade, The New Barker, The New Barker dog magazine.